Dina Recanati was born in Cairo, and grew up in Egypt. She traveled to England where she studied art and history, and then moved on to the Art Students League in New York. Presently she lives in New York and Israel. 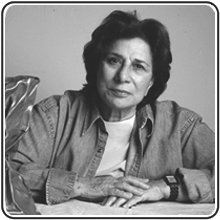 Her work can be seen at the Israel Museum, Jerusalem, the Tel Aviv Museum, Ben Gurion Airport, Tel Aviv University, The Jewish Museum, New York, the Herziliya Museum, Weisman Institute of Science, Rehovot, Israel and in many other public places and private collections. Recanati’s images emerge from experience and memory, both personal and collective, as an homage to ancient cultures, to earth and time. While her art is often a combination of painting and the sculptural, the three-dimensional is conditioned by prevailing esthetics. It is never solely about formal issues and strategies but always rooted in metaphor. Winds that have been gathered together across continents and energizing winds from within are the framework of Dina’s aesthetic life. Her paintings, using fabrics she molds like clay onto a tactile surface, are in-sites of meditation and memory abstracted into impeccably modulated art works that could be considered inner landscapes. A swell of curves is set against angular austerity and lines that shoot out as rays. Her tones, particularly intriguing, can be of restraint or unruly and instinctive with the richness of complexity controlled. Desert beiges issue directly from the Middle East; brilliant blues – an exciting mix of Persian blue, cobalt blue, turquoise and others- convey a dramatic mood, and the sublime white in its unalloyed purity provides the solitude where contemplation begins. Each work emerges as a rhythmic entity, not of a single incident but a daring synthesis of past and present, day-dreams and night dreams, as Dina creates a secure order for her emotions. Neglectful of space and time, she gathers the many threads of her life into meaning and with each confluence of the disparate elements that issued from her meandering path she points to a new unity, establishing a rebirth that yields up a unique harmony. Confronting her art, which hovers between the reality and unreality of nature, we are beckoned to perceive a window to infinite possibilities. As Constable wrote, “The art of seeing nature is a thing almost as much as the art of reading the Egyptian hieroglyphics.” Dina challenges the creative capacities of our willing minds to seek clues from our own experiences as we come along on a voyage of discovery, and peer into her near elusive inner sites.